My love for Greek food goes back to my late teens when we would have dinner at a wonderful Greek restaurant in the valley. The waiters would throw plates and dance and sing and keep delivering never ending mounds of fabulous food to our table. I just couldn’t get enough of their, “Joie de Vivre”, I should know how to say that in Greek, but eh, not so sure. Flash forward a couple years later and I am sailing around Mykonos in awe of how beautiful Greece is and trying to figure out how I can make a living picking olives from the trees. The meals started off with spanakopita, greek spinach pie, with layers of perfectly flaky phyllo dough that melts in your mouth, don’t even think about the calories, just look at that gorgeous blue sea. I have wanted to create this fabulous pie, but always thought it would be so much work. I imagined it being gobbled up and me crying saying, “I worked on that all day” But really it is just like making layers in a painting when you are brushing the olive oil over the phyllo. Just get comfy in your chair, and see yourself creating a spinach masterpiece. Phyllo is a magical food, how it puffs up perfectly browned after baking for what seems like not much time. This recipe is perfect for a brunch party or an appetizer for a holiday or just great for dinner. In a pan, saute onion in 1 Tbsp olive oil until soft, set aside. Combine spinach, egg, feta, mozzarella, vinegar and mix. Set aside. Brush bottom of a 17 x11 Jelly Roll pan with olive oil. Place one sheet across the bottom and top of pan, continue placing layers of dough and brushing with olive oil after each layer. 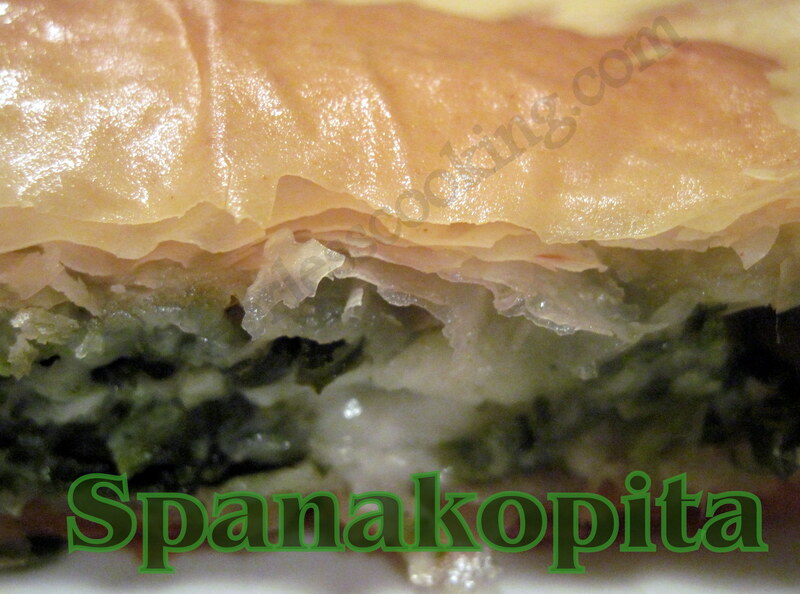 After the first roll is used up place spinach and cheese mixture and smooth out over phyllo, continue to layer the next roll of layers as before with olive oil. With a sharp knife, score the top layers into diamond shape. Bake in oven for 40 minutes or until golden brown. Makes 24 pieces.